I suppose I should care, or sound hip enough to say, that I wanted legalized marijuana to pass in Ohio. Not just medical, but recreational as well. That was the big issue for yesterday's vote here in Ohio. Actually, that's not true. Not for me. Issue 1 to create a bipartisan commission to (re)draw legislative districts is my biggest vote - and it has had almost zero publication and few robocalls. I'm tired of the reigning party (the GOP) getting / trying to remap things to for their advantage. Now, back to issue 3 - I will admit to having smoked pot in the past. Unlike Bill Clinton, I even inhaled. But I can't say I was ever a pot-smoker per se. It wasn't my thing. The truth is, I am not sure I care(d) one way or the other. If the revenue that Colorado reports is accurate, it is something Ohio can certainly use. How they will regulate its use, as they do with impairment ala alcohol, I will wait to see. Of course, it was a hot topic. Every day letters to the editor for and against. Every day editorials. Every day just plain old articles in every newspaper. It might have been coincidence that 60 Minutes featured heroin use in Ohio two nights before the election. 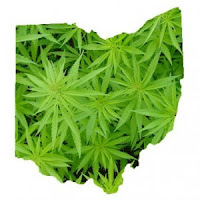 It's doubtful it was a coincidence that Mike DeWine - our Attorney General, advocate against legalization and all-around douchebag - made all the media rounds the following day. You can argue whether pot is or isn't a gateway drug. For me, alcohol was my first drug. Pot my second and yes, heroin (but only once - so that's ok, right?) was my third. But 60 Minutes and DeWine certainly put that into question on Sunday. People decried the monopoly of only x amount of people allowed to grow and sell it. In certain ways that was a problem for me. But on the other hand, one or two companies hold all the rights to all the casinos in the state. Alcohol, though now it can be sold at other places than state stores, are still actually sanctioned by the state. I'm not sure the distribution of pot is any different in those regards. I was enjoying the TV ads. Vote issue 3 to create jobs. Because in Ohio which lags in economic recovery from the 2008 fall-out, it is still all about jobs. Not one word about the actual issue at hand or what it was about. I suppose I'd need to be high to listen to that tripe. (though you have to last to 00:34 of the video. People say pot isn't addictive. I know a few examples of people who not only cannot go every day without it, but sometimes cannot go a few hours without it. It is not that they can go without and don't - they CAN'T go without it. I mean, the same is true with alcohol. And meth. I mean - I've heard. Jimbo had it right a few years ago .....when it comes down to it, it my issue might be due to pot breath. Sorry guys, but here's something people won't tell you - you smell horrid. As I draft this, results are not final, but legalization is failing - and not by a little. Two-thirds were voting 'no'. But even if it passes, I would assume there would be some legal wrangling on if and how it gets launched. I will post an update in the comments after I wake up and see what the end-result actually ends up. Like Jack Webb said, "Marijuana is the flame, heroin is the fuse, but LSD is the bomb." UPDATE: the marijuana issue was soundly defeated: 65% against. I believe this had less to do with actual growing and selling of the stuff as it did with the monopoly involved behind it. At 51 years old I've never tried pot and don't plan to. However, I do think it could be reasonably legalized and regulated to the same degree that alcohol is regulated. I keep up on the 'medical' data on MJ and it is mostly a fool's paradise. I wish my patients would stop trying to pass it off as 'healthy' and without any problems. If we are going to allow it like booze and tobacco (very nasty both) then lets' call it a recreational thing.